"pretty it up" patio weekend — Pencil & Paper Co. The weather is finally looking good for this weekend- so think it is time to get our back patio "prettied up"!! Today is clean and organize the patio day and over the weekend I get to do the fun "pretty it up" part! 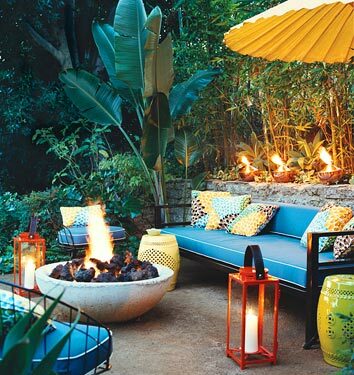 I think this image (from my old favorite- Domino mag) is great inspiration for what I am going for....relaxed, inviting, and a fun red, blue, and yellow color palette!!! Maybe I will even splurge on some sort of fire pit and a few new accessories!!! Oh, by the way West Elm currently has 15% off all outdoor furniture and accessories! I will post photos of my "weekend progress" early next week! Would love to hear how your summer yard prep is going??? ?